I woke up to a bright day, such as was forecasted. Finally! I have been in Iceland for exactly a week and this is the first morning that sun tickled my face while getting up. And it could not be better. 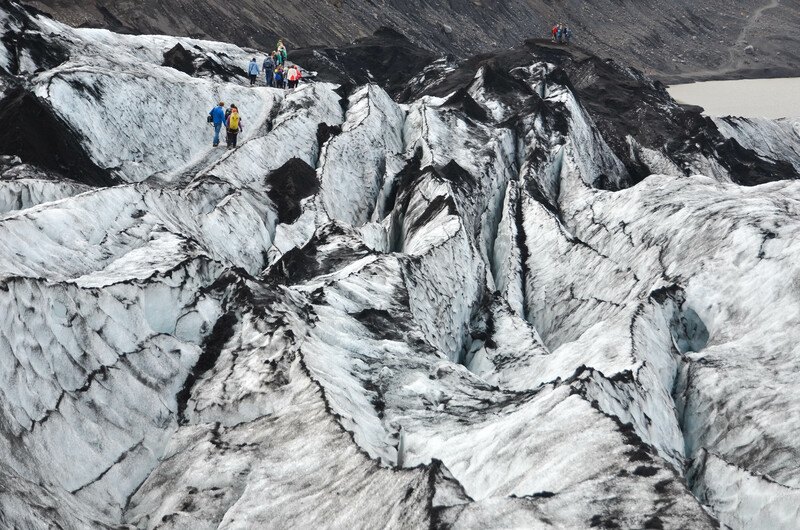 Today I am going to explore one of the most characteristic features of Iceland – glacier. 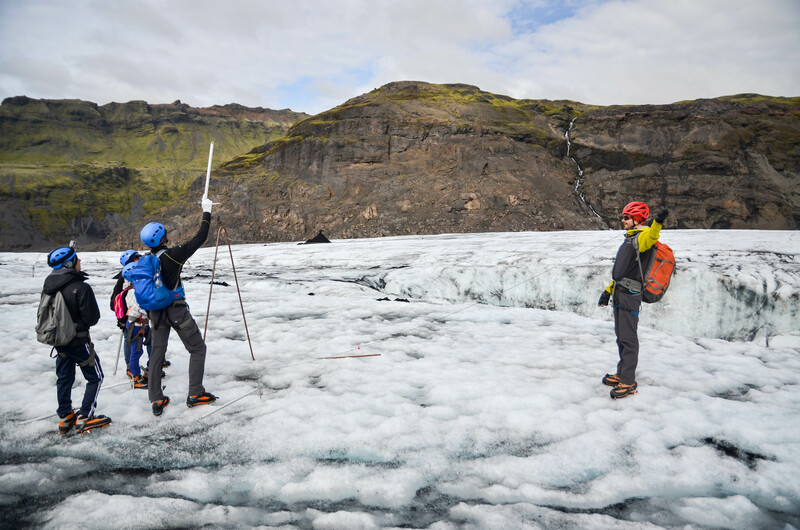 I am really excited not only because it will be the first glacier hiking in my life, but also because I will finally see what is the true object of Asgard Beyond, Icelandic mountain guiding agency I decided to spend my internship with. One of our guides, Raggi, picks me up at my Reykjavík flat with a company van. 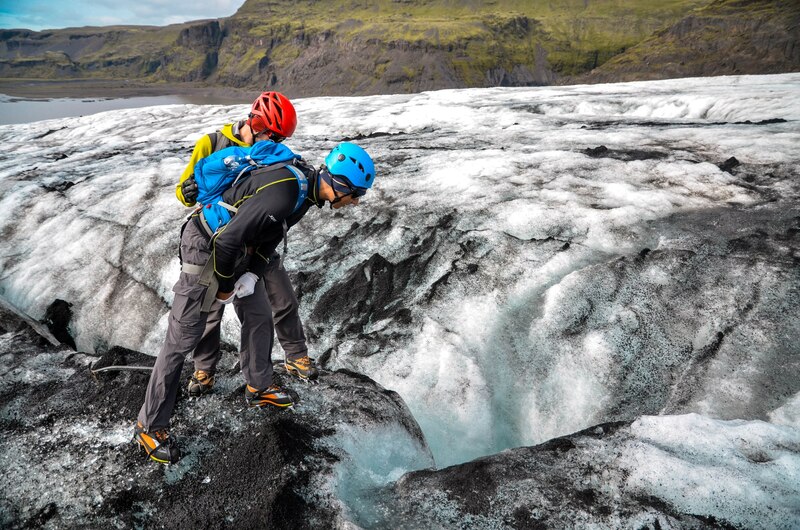 This time customer’s don´t travel with us, we will meet them at Sólheimajökull glacier, after two hours ride. On our way, Raggi tells me a lot about the breathtaking South coast we are passing. We can see a power plant, which brings energy and hot water to Reykjavík. 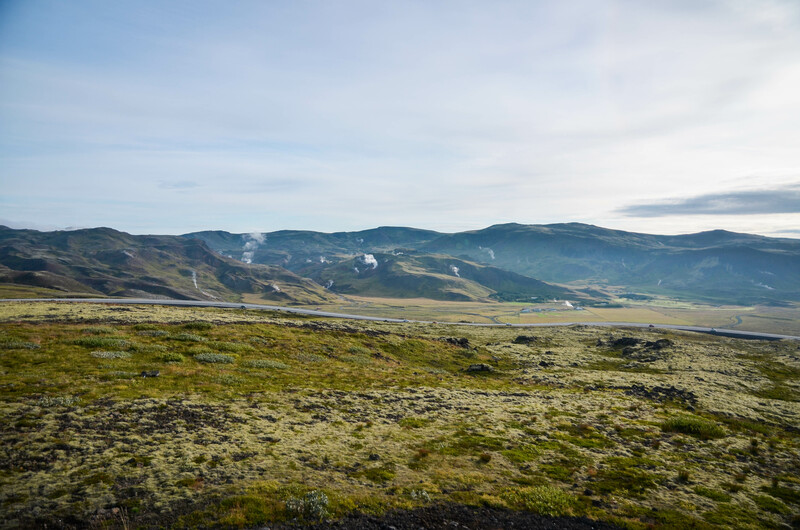 On the left horizon, Hekla with its sharp silhouette reminds us it is just a high time for it to erupt and on the right; the Westman-islands form the shape of a crocodile emerging from the Atlantic Ocean. Dozens of waterfalls are washing steep slopes of mountains formed from volcanic ash. What a dream landscape! There are not many cars or buses at the parking lot close to the glacier, because our tours leave a bit earlier than the big coaches, therefore, other tourist companies tend to come much later. Israeli family with two children already waits for us there. “Hello, I am Naama! I hope I get to touch snow today!” reports 12yo girl in the beginning and even though Raggi has to let her down with the snow, she stays hugely enthusiastic for the whole trip. 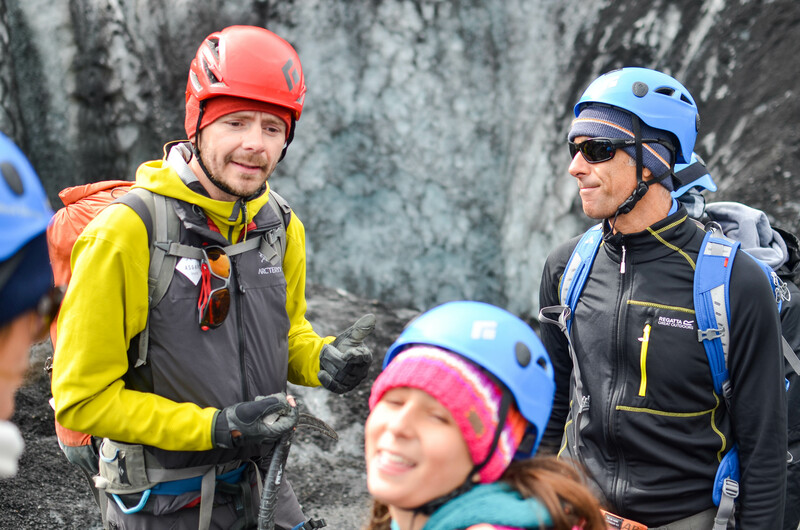 Raggi starts explaining the plan and everyone receives waterproof boots, clothing, and crampons, ice axe, helmet, and a harness. 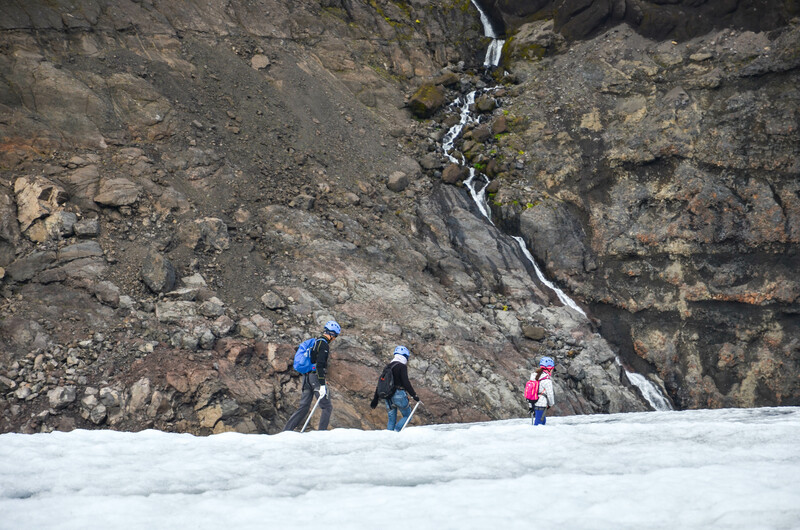 After a short walk to the edge of the glacier, our guide explains to us step by step how to put the crampons on and double-checks whether we got it right. 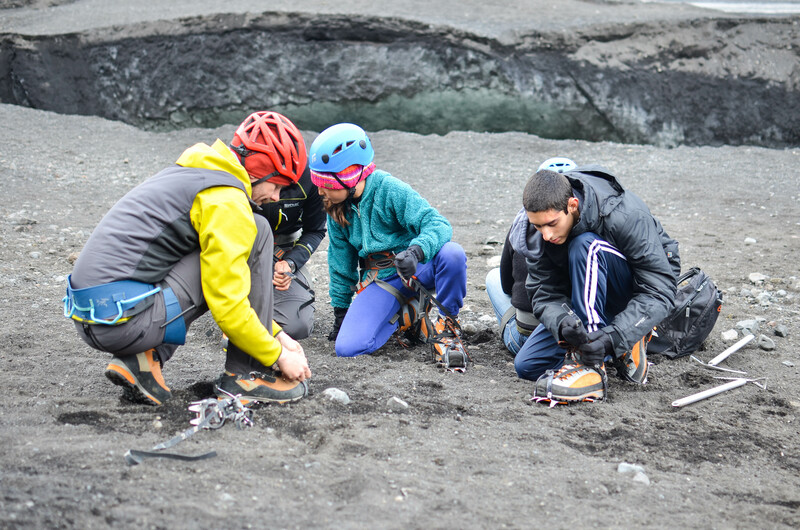 “You must spread your feet with the width of your shoulders not to tangle the crampons together while walking,” Raggi explains and demonstrates, while we all start repeating after him looking like a penguin family, as Naama remarks aptly. After a few more pieces of advice, we finally start to walk up at the glacier. At the beginning, it is covered with a thick layer of volcanic ash, which thins while we are rising. Every few minutes we stop and Raggi tells us more about what actually is a glacier, how does it move and changes and what can we find here. 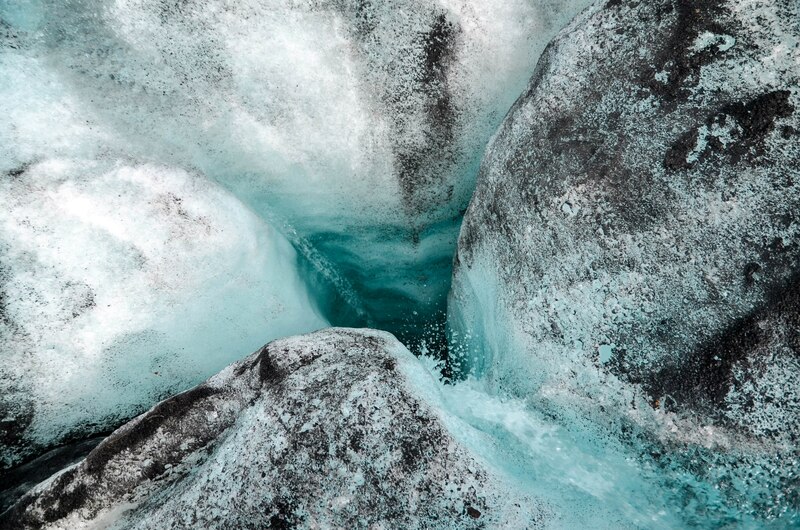 As an inexperienced girl from the Czech Republic, I could never imagine that a big mound of ice could be so fascinating! 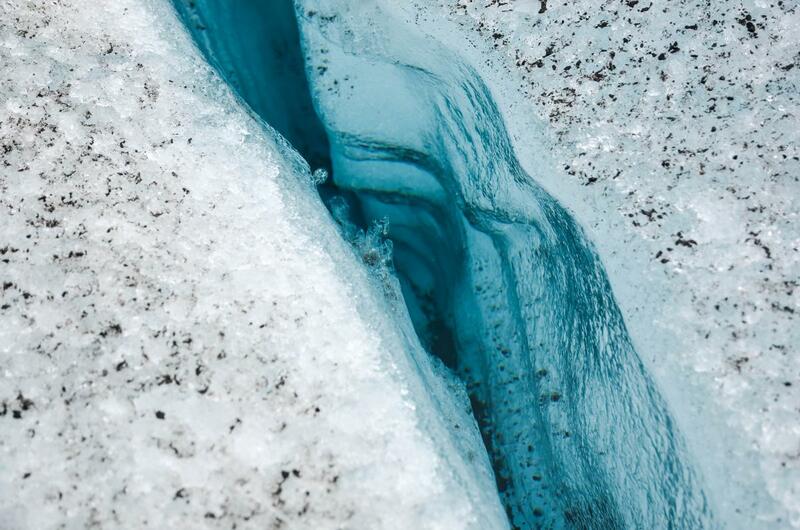 Even though you can´t spot any animal here, omnipresent streams of water make glacier very lively place. Sometimes water digs all the way down to the soil, making up to 100m deep “moulins”. Some of the shorter ones create a perfect opportunity for ice climbing. 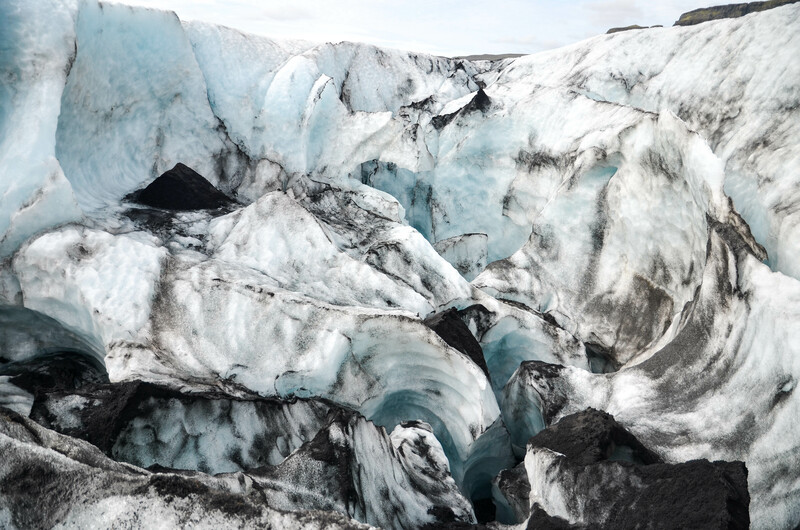 Volcanic ash on the other side creates sharp “pyramids” by preventing the ice under it melt as quickly as the surrounding. 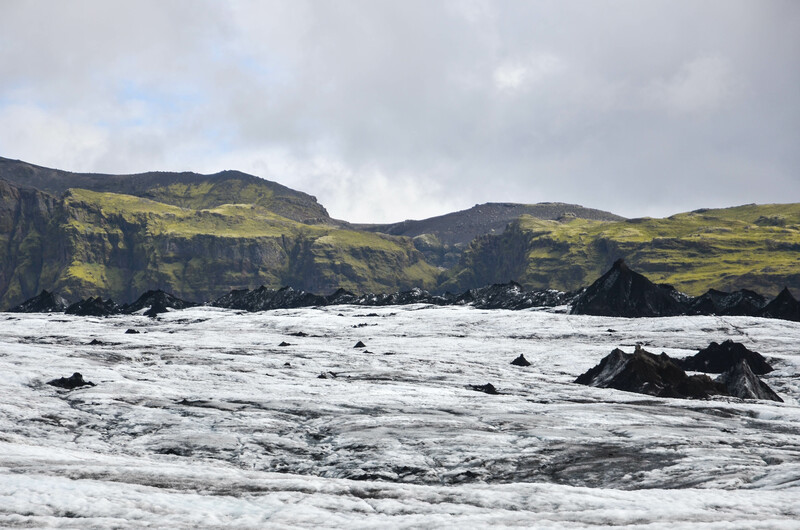 During the three hours long sunny walk we get to see all these formations, drink from a glacier stream and give our hands special treatment with mud coming from 2010 Eyjafjallajökull eruption (yes, I copied this name from Google). “You would pay around 100 euro for this in a tourist shop,” smiles Raggi while convincing Naama´s mother to put the mud on her face, unsuccessfully. 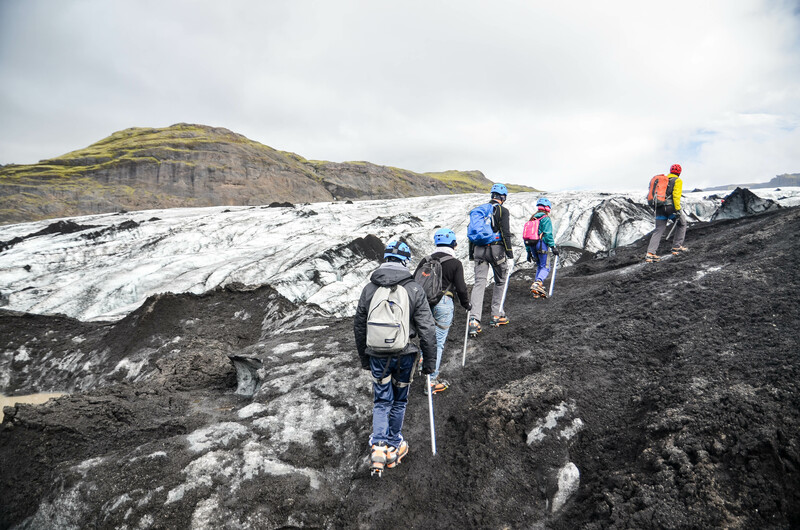 As we get off the glacier which we had almost for ourselves, many groups of tourists start to hike up the icy attraction. The right time to leave! While we fight with our crampons again putting them off, Naama evaluates the trip openly: “I will not forget this day for whole my life! 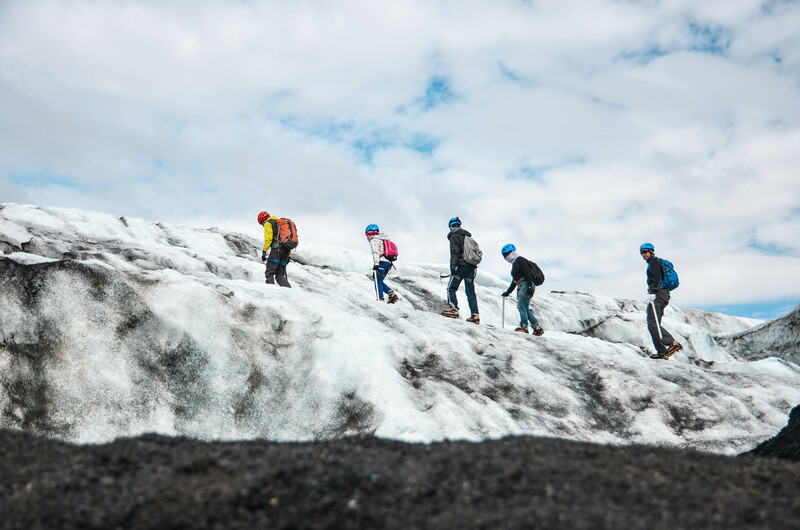 Thank you very very very much!” Same as her, I am highly surprised how a day spends at glacier can be educative, sporty and fun at the same time. Hope to come again to this black and white paradise!